It’s Independence Day! I feel like the holiday weekend started Friday afternoon . . . even though I, personally, am not actually taking any vacation time. Nevertheless, it’s hard to feel industrious when everyone is in and out of the office, and wearing very casual clothes. I will be wearing more long dresses this summer. 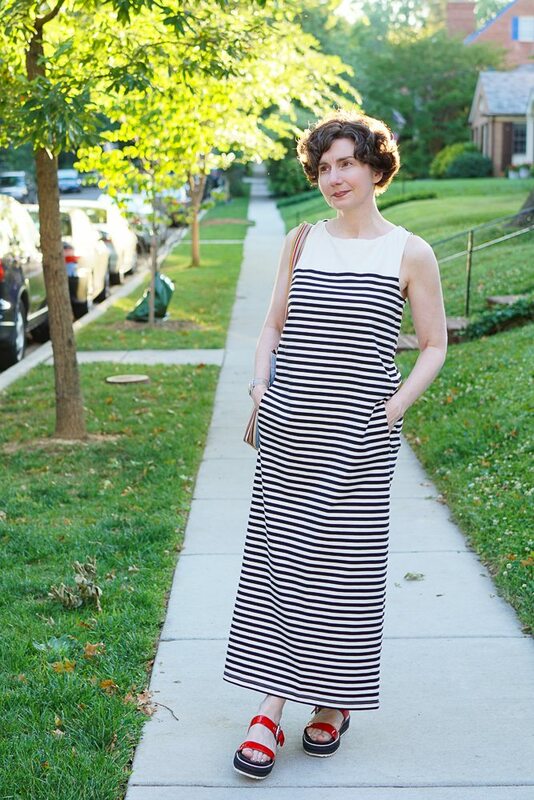 You may remember that I pioneered the maxi-dress — back in the 90s — but have never received credit for it? After a long break from the style, I am finding it very comfortable this summer. I found this Max Mara dress on sale at MatchesFashion.com. The allure of the modified burqa . . . I am feeling it, for weekends. 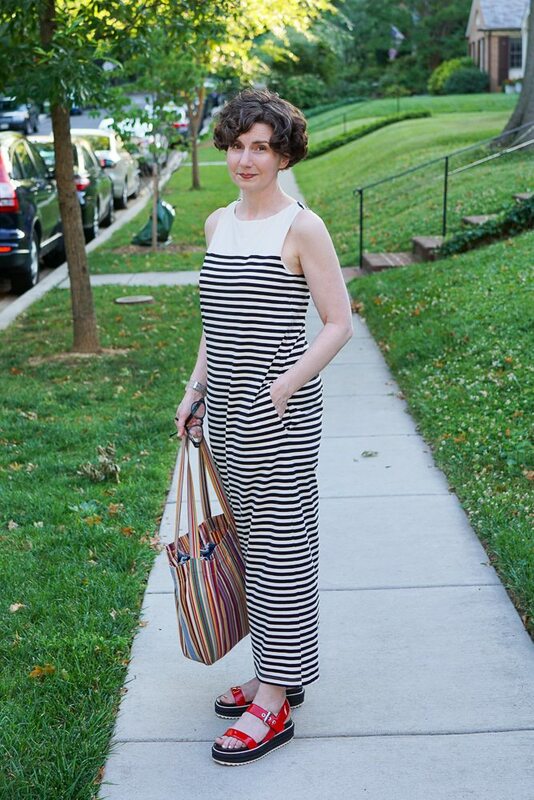 I would not wear a maxi-dress to the office. The look is somehow both too dressy (full length = evening-wear) and too casual (evening-wear during the day = insouciance) for work. 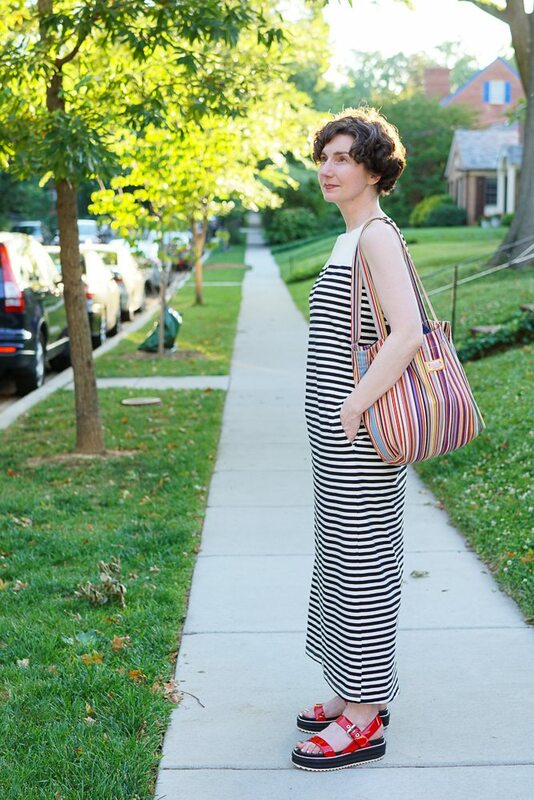 I would, however, wear this striped dress to work on a Casual Friday. It is, colorably, a midi-length dress that I couldn’t be bothered to shorten for my frame. Two quick observations for today. Observation No. 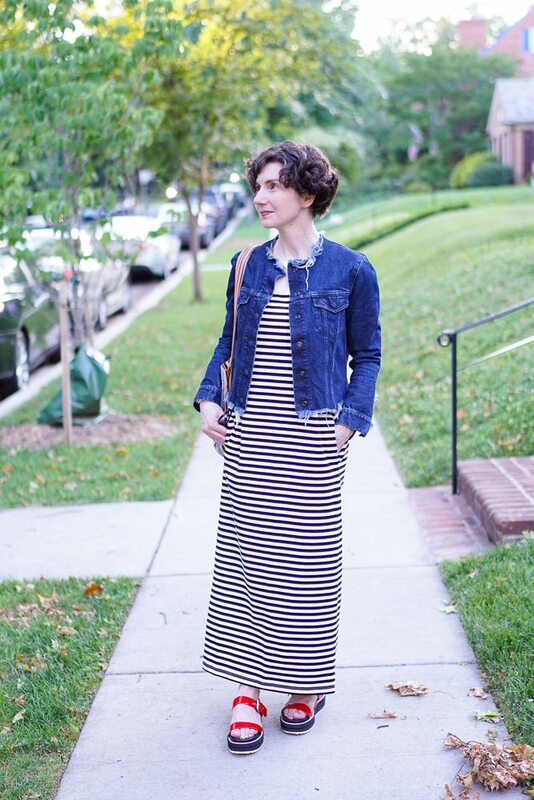 1: A maxi-dress is a chic way to cover-up. My legs are not my best feature, so I feel fine about covering them. Observation No. 2: If you ever need a dress, for any occasion, and don’t want to spend much time looking, start with Max Mara. The label is reliably stylish, well-made, and appropriate for every occasion. You won’t need to buy a special bra or follow heroic laundering protocols. And, Max Mara is sold through a wide variety of retailers, which means that it generally can be found on sale mid-way through the season. One Scorching Hot Tip: Lord & Taylor has a wide selection of Max Mara and it is deeply discounted during mid-season sales. Now back to this specific dress. 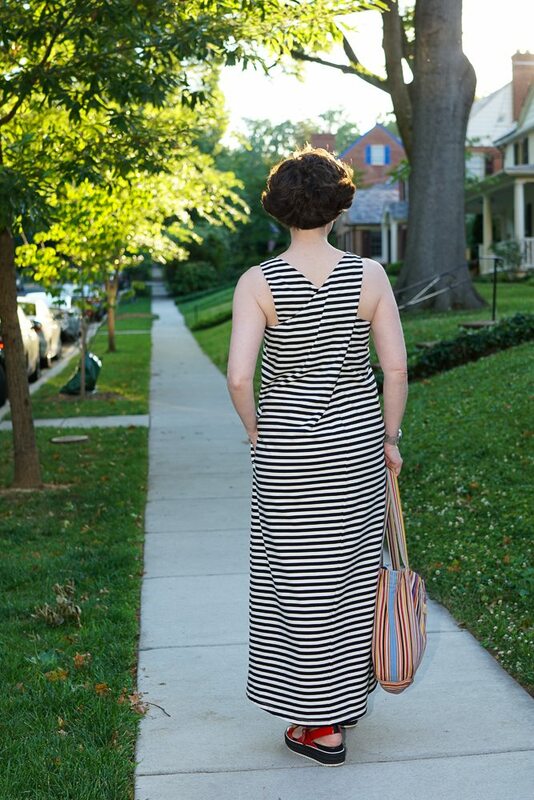 So much to appreciate: pockets, stripes, and to keep things interesting, a twist in the back. Perhaps I spoke to soon when I disclaimed specialty undergarments. I am wearing a strapless bra here because I was too lazy to convert another bra to a Y-back configuration. But that’s not a high level of specialization. Come closer and appreciate the details. Black sandals would look nice, but I thought a pop of red would be more fun. Who is this little pom-pom? 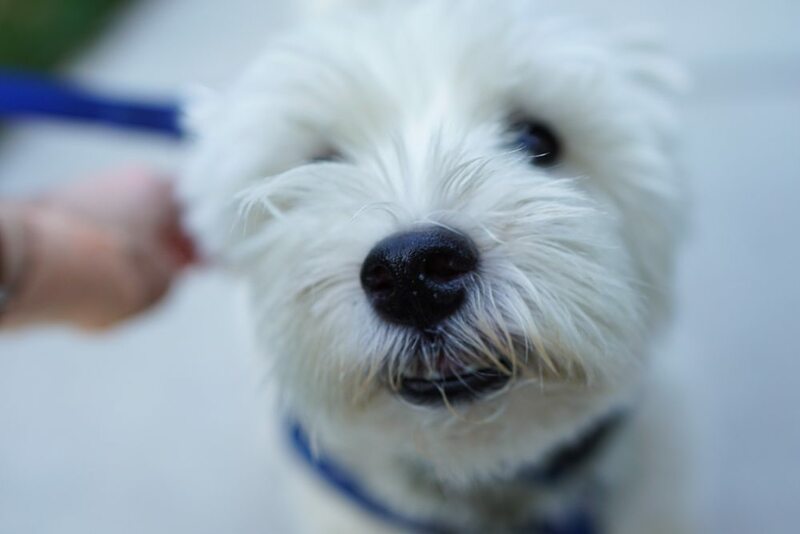 This is Mendel, who passed by while we were taking pictures. Yes, he is named for Gregor Mendel, who I feel confident did not predict that his contributions to science would inspire people to name their pets after him, 300 years after his death. To finish things off, a denim jacket (for air-conditioned environments) and a striped canvas bag (because stripes beget more stripes). As you celebrate Independence Day, take a moment to: (1) marvel at the bravery demonstrated by the signers of the Declaration of Independence;* (2) appreciate our free and independent press; (3) rebuke any elected official who betrays the founding principles of this country by using public office to attack the media. My firm always closes at 1:00 p.m. the day before any official (i.e., federal) holiday. It’s not a written policy, and it’s not guaranteed, but it’s happened without fail for the 17 years I’ve worked there. Isn’t that a generous, and sweet, micro-benefit? It seems like a small thing, but it makes people very happy. * For those interested in learning more about the AmRev, I recommend Founding Brothers and American Creation by Joseph Ellis. He writes such readable and interesting histories. 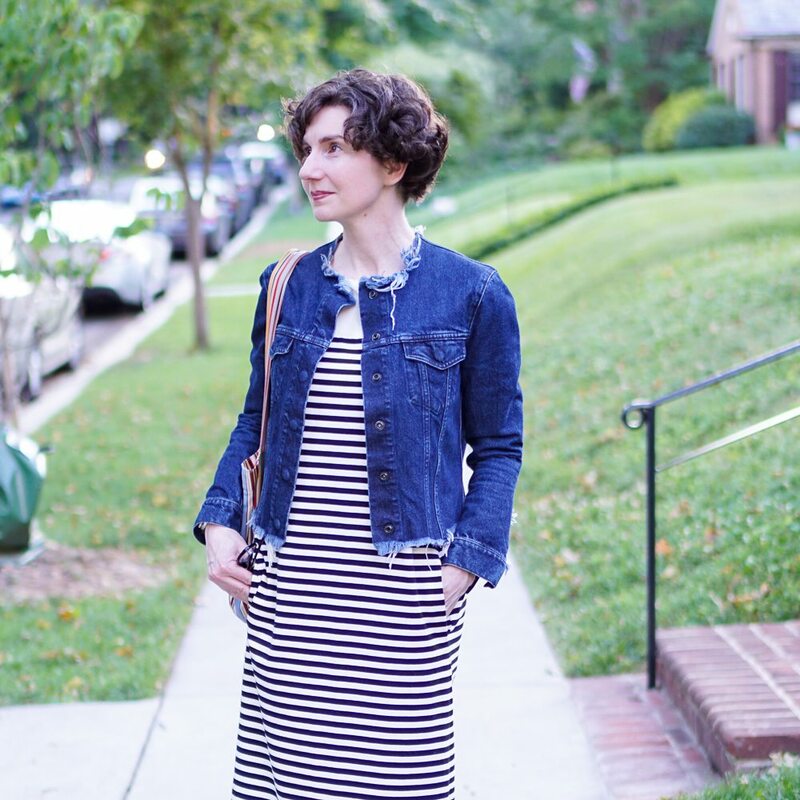 Loud applause from over here: summer outfit perfection! I could not agree more about Max Mara, my favourite label! I think you are a remarkably talented writer. I suspect you could do near anything you put your mind to! Super high IQ is my guess!….and a great standardized test-taker? And I especially like “Weekend Max Mara”, though I have yet to own any. Thanks for your blog! Keep them coming! Wendy Blank, you spoil me! So glad you enjoy the blog. I will do my best to keep the posts flowing! Thanks for the hot dress tips, the hot book tips, and the hot how-to-celebrate-Indepence-Day tips. I want to be your one-stop for all things! I strongly disagree with your assessment of your legs! I think they are one of your best features and you should les mettre en valeur, as the French say (“highlight”, “show to advantage”). Love the effect of a chic Roman or Athenian from the back, toga, sandals and all. It also occurs to me that this would be a terrific dress for travel, comfy enough for transit and good-looking enough to go to dinner once you get to your destination. Max Mara is such a great resource for grown-up dressing. It’s one of the rare companies which seems to be able to manufacture offshore without losing their grip on quality and absolutely yes on the wide distribution. One of their trouser suits in tropical-weight wool would be the first thing I’d get if in need of something that will work for all professional occasions (swap out the jacket for biz casual) while looking and feeling great, regardless of whether shopping in Asia, Europe or north America. All the best with the rebuking ! Excellent call on AmRev scholar-author Joseph Ellis, a most readable writer on our revolutionary period. Ellis turns the United States of the late 18th and early 19th centuries into pleasure reading. Even beach reading. I will be very careful, Cookie! I promise. It’s all about that cross over in the back – I love a surprise!